At Ampla we put a high priority of environmental aspects and specifically on the impact of different types of packaging on the environment and we enforce solutions which are environmentally friendly and their implementation improve the current situation. The result is introduction of MASTER PACK package model with the ratio between goods and packaging material is much better and at the end represents minimum wastes on the customer side. The solution is cost saving in terms of transports cost as well in the terms of waste and packaging material disposal. This kind of packaging is especially convenient for medium and bigger printing houses capable of moving around the material on standard pallets. Is has to be noted, that the MASTER PACK anyway contains the smaller packages of offset plates packed by 30 or 50 pcs depending on the size, optionally plates can be stacked in one pack according loader capacity. The MASTER PACK usually contains about 1,000pcs (20 packs per 50pcs platinum), or 990pcs packed in 30 packs (33 packs containing each 30pcs of plates with dimensions. 1030 × 795 or similar). 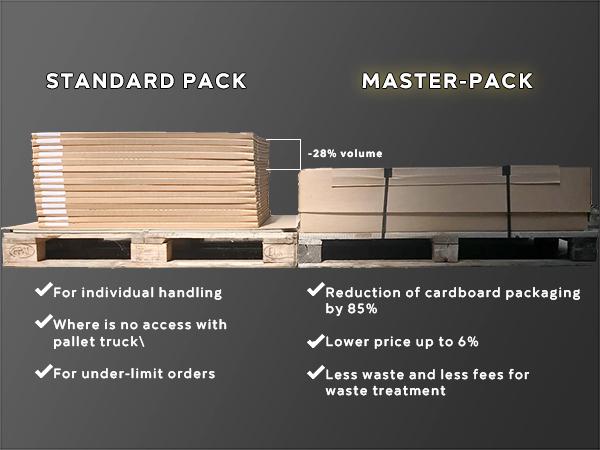 MASTER PACK packaging can be customized to customer requirements for almost all dimensions and types of plates.